‘Eddie’ Would Go, and Now, Eddie Will Go! 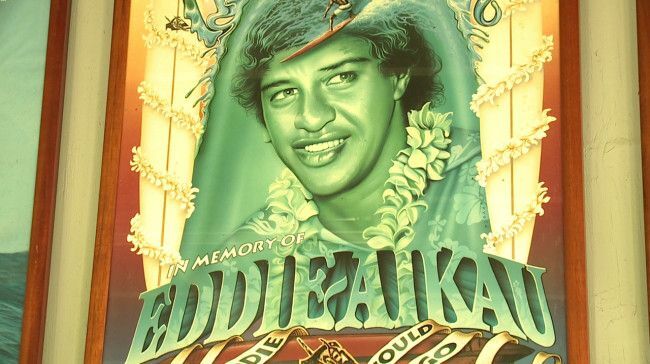 Eddie Aikau’s Big Wave Invite has gotten a green light this year after all. WSL (World Surf League) announced Monday that Quiksilver and the Eddie Aikau family have resolved their differences so that the 2016-2017 Quiksilver in Memory of Eddie Aikau Big Wave Invitational holding period will kick off as planned Dec 1-the end of February 2017. An opening ceremony is planned for Thursday Dec 1. ‘The Eddie’ has been one of the world’s premier surfing events for over 3 decades launching in 1985. It only occurs when there are consistent, rideable waves of at least 15-25′ Local Hawaiian Scale at Waimea Bay during the three-month holding period. Last February, over 10 thousands of spectators jammed Waimea Bay when the surf contest was held for the first time since 2009. The competition has only happened nine times since it began in 1984. “We are proud to see the tradition of The Eddie continue without interruption — a testament to our respect for Eddie Aikau, the Aikau family, the Hawaiian people, and the community at large,” said Pierre Agnes, Quiksilver’s CEO, in a news release. The contest is invite-only and for the first time in it’s history, a father and son are invited — Michael Ho and his son Mason. It’s also the first time a female athlete — Keala Kenelly — made the alternative list. Glad to see that “The Eddie” lives on. Congrats to the Aikau family for keeping the memory of their talented and courageous son alive. Eddie’s story is certainly one of the most iconic and inspirational tales in the history of surfing, or any sport for that matter. Kind of a shame that a bloated commercial entity such as Quiksilver has to be involved in such a noble event. Fortunately for all of us “regular” surfers out here, the spirit of Eddie Aikau and his family still can shine brightly amidst all the corporate over-kill that is modern professional surfing. Well Said Droid, Well said!